The referee's interruptions had plenty of people talking. Former world heavyweight champion Lennox Lewis: "#JoshuaParker wasn't the scrap I'd hoped it would be but AJ fought well and smart. Kept JP at end of jab. 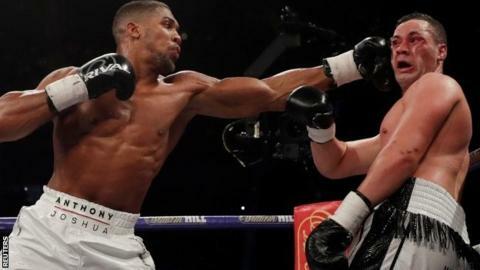 Ref seemed too hurried to break them up at times...but it was a clear win for AJ and he showed maturity and patience." BBC Sport presenter Gary Lineker: "Referee on points for me." Meanwhile, one potential future opponent seemed untroubled by the manner of Joshua's victory. Ex-world heavyweight champion Tyson Fury: "There can only be one. I'm the true king and think people seen that tonight."